...that Ikora Rey was the first Guardian to achieve a 25-match win streak in the Crucible? "The others sing this song of Light and Dark. We, together, have transcended such unimaginative limitations." The Awoken are a race of humanoids living in the City  and also the Reef. Ruled by a Queen and her brother, they were generally isolated from Earth, long avoiding contact with the City until the Wolf rebellion and later the Taken War. Awoken are standoffish and resemble baseline humans, with the notable exception of having pale blue, purple, green, or gray skin. They also have luminescent eyes with glowing irises. Beyond physical appearances, the Awoken seem to possess powers and abilities beyond their human ancestors. The Techeuns are a particularly notable example, though ordinary Awoken can also experience visions in the form of dreams. This is a side effect of them being within Earth's universe-within the Distributary, the Awoken do not have paracasual abilities, but are so intertwined with the fabric of its existence that they do not age past a certain point. "How did the Awoken survive?" It is said the Awoken were born in the Collapse, descended from those humans who tried to flee its wrath. Something happened to them out on the edge of the deep Black, and they were forever changed. After their race was formed, they took up residence and constructed the Dreaming City in the Asteroid Belt. Today many Awoken live in the Reef, aloof and mysterious, but others returned to Earth, where their descendants now fight for the City. Earthborn Awoken sometimes venture out to the Reef, hoping to learn its secrets—but find no special welcome from the reclusive Queen. In Forsaken, it is revealed the Awoken are the descendants of the crew and passengers of the Yang Liwei, a generation ship that left Earth shortly before the Collapse in an attempt to find a way to live without the Traveler, and thus refused to take a side when the Darkness attacked the Traveler. During the initial sparring between the two acasual entities, the ship was at the centerpiece of an anomaly in space time that sucked it and all its inhabitants into a newborn universe, the Distributary, during which they lost their physical forms and reincarnated into their present ones under the direction of their captain and first queen Alis Li. 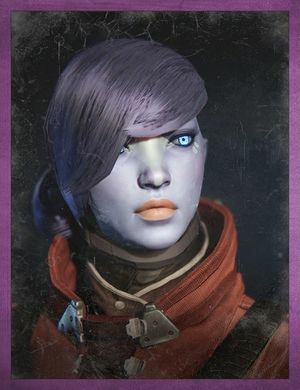 Unbeknownst to Alis at the time, she was not the first to regain consciousness, but rather Mara Sov was, and it was Mara who quietly manipulated Alis into giving the Awoken physical forms that could be injured or die, as Mara believed truly omnipotent entities could not evolve or live meaningful lives. Later, Mara would lead some of her people back into Earth's universe and colonize the Reef, though some of them would go farther and emigrate to Earth itself. "We gathered to fight against our twilight, King and Devil, and Winter, all of us but us, the Wolves. Why? What kept us from the Gap? The Reef. The Queen. The slavers who played us against each other and docked us into subservience. These sly sterile un-people, these mirages with cold minds twinned to their own, these Carybdis butchers, they set us against each other. She played us. She made herself our Kell." The Reef Wars marks the first time the Awoken emerged from their isolation. Noticing the Fallen massing to destroy the Last City in an effort to steal back the Great Machine, the Queen chose to intervene and keep the oblivious outsystem House of Wolves from joining their brethren on Earth. Striking suddenly, the Awoken fleet destroyed Ceres and scattered the Wolves across the Reef, beginning a several-year-long campaign that whittled the Fallen's numbers and nobility to insignificance. After Variks, a Wolf scribe defected over to the Queen's side, the remaining Wolves were defeated and Skolas, their leader, imprisoned. The Queen later gifted Skolas to her allies, the Nine, for their role in defeating the Fallen but they released the Wolf Kell, beginning the Wolf Rebellion and forced the Reef to open itself to Guardian access. "The Awoken died for us. They gave their lives to save the system, to stop Oryx's fleet at the outer planets. We must honor their sacrifice. We must face the Taken King without fear. Queen Mara has given us a gift. We must not waste it." The Awoken were among the first to respond to Oryx's invasion. Attacking his fleet out around Saturn, the Queen and her Witches sacrificed themselves to fire the Harbingers, mysterious weapons or entities of incredible power, at the Hive Dreadnaught. Despite destroying a good portion of Oryx's fleet there were no marks made upon the flagship, and shortly thereafter Oryx ended the battle with a single blow from his cannon. Despite a significant loss of Reef leadership, including the Queen and a missing Prince, the Reef aided the City and its Guardians in destroying Oryx's Taken. Setting bounties upon several lieutenants the Reef oversaw their extermination and eventual rooting out of the Taken Blights in conjunction with the Vanguard. During this conflict Petra Venj, Acting Regent-Commander, continued to search for the missing Queen and preventing a resurging House of Wolves from regrouping on Mars. With the aid of Variks and the Guardians the nascent Wolf house was scattered again. Following the resurgence of Uldren Sov, he led a rogue Fallen house known as the Scorn against The Reef, betraying his own people, and driving the Reef-borne Awoken into complete chaos and disarray. Cayde-6 was murdered in the Scorn's escape from the Prison of Elders, and Reef agents were forced to work with Guardian forces to prevent the total collapse of their society. ↑ (Immortal in the Distributary)"Many Awoken still alive in the present fought in the Reef Wars, which took place over 126 years ago, as the Wars were fought before the founding of the Crucible, and according to Ghost Fragment: Cayde-6 the Crucible was active 126 years ago." Joe Staten and Christopher Barrett described the Awoken as being beautiful, exotic, and mysterious. They mentioned the team looked at elves, vampires, ghosts, and angels to "capture that exotic, sort of ethereal feel". They have been described as being of "otherworldly origins." The Awoken once ruled Mars, explaining the reasoning behind Valus Trau'ug's unsanctioned attack. Concept art of an Awoken female Hunter. Commander Zavala, Awoken Titan Vanguard. Early concept art from Destiny's development as a fantasy game.